It’s almost impossible not to judge an author by their body of work, and with 1971’s run of issues we must presume Stan was feeling a lot of anger. It’s worth noting that, now nearly in his fifties, he was far removed from the archetype of the angry young man. Yet even if his rage was a mature reflection rather than impulsive reaction, rage was what was written all throughout the year. Never before had the Fantastic Four been so cold, so distant, so completely unlike the "family" they were established as. 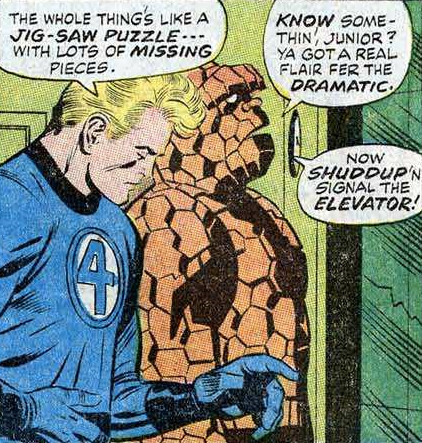 With this in mind, what are repetitive plotlines – the Thing turns against the FF; Reed turns against the FF; Johnny and Ben fight; The Hulk and Ben fight – are given fresh spin by their shocking bleakness and honesty. In fact, it’s not until the August issue that we approach some semblance of warmth between the regulars. 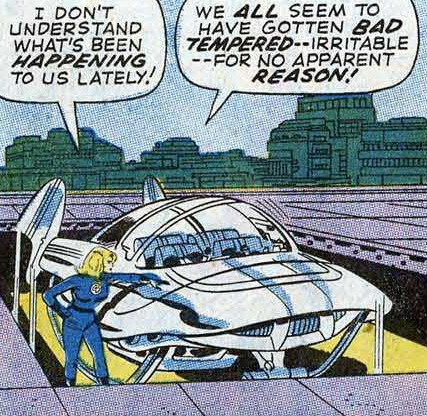 Even discarding the fact that eight of the issues of this run involve FF members made hostile by artificial means (failed experimentation, mental possession…) even general day-to-day exchanges usually result in something like #107’s "What did you do to him, Reed?" "Shut up, kid!" Amidst all this open resentment is Ben’s psychotic rebuttal to Alicia: "I don’t needja anymore! Don’t wantcha hangin’ around! I can do lots better now -- dig?" Yet there’s a wider conflict at work here. We learn that Reed, formerly a hero of World War II, has served on anti-war committees (#106) and hostile protest crowds (under John Buscema’s pencils, multi-racial) gather outside the FF headquarters, proffering “Up the F.F.”, no less. Perhaps it’s reading into it too much to say that the FF in 1971 was Stan Lee’s reaction against Vietnam and the Nixon Administration. After all, external factors in his own life could easily have been influencing the title: in 1968, at the peak of Marvel’s powers, the company was sold by Martin Goodman (the husband of Stan’s cousin, with whom he had a reportedly aloof relationship) to the Perfect Film and Chemical Corporation, later known as Cadence Industries. While this wouldn’t be the last time Marvel had a new owner, it was the first, a worrying time for Stan, even though the sale was based on him remaining with the company, and by 1972 he was the new Producer. Adding to this increased responsibility was the mild decline in Marvel’s fortunes (sparked by a 3c price increase on the titles), the recent death of his father and his work on a debut screenplay (The Monster Maker, a collaboration with respected director Alain Resnais, which was sold for $25,000 but never made) and it’s little wonder signs of stress were leaking into the title. This, more than anything, explains why Stan plotted the entire run but handed over the scripting from October onwards to Archie Goodwin, who in turn was standing in for Roy Thomas. Such a thing is symptomatic of these issues in general – while the character interaction and storytelling techniques make them all eminently readable, the actual plots themselves don’t hold up to much. Janus gets destroyed in the Negative Zone, Annihilus tries to find Earth and can't, while an impressive new villain, the Over-Mind, is dispatched by the Stranger, a character who originated eight years earlier in the pages of The Uncanny X-Men and had never appeared in The Fantastic Four. As with Agatha Harkness casting a spell for not the first and definitely not the last time, many of the plots seem to be resolved by deus ex machina. There's also the simple matter that the plots don't always make sense. While the 60s had given us stories such as Tomazooma, the Living Totem or Kurrgo, Master of Planet X, look out for the Over-Mind being completely surprised to find The Fantastic Four have superpowers in Issue #114... the issue after he's mind-controlled the New York Mayor to force the team to disband! (Said Mayor bears more than a passing resemblance to the real Mayor of the age, John Lindsay, though perhaps because he's depicted as the Over-Mind's puppet, he remains unnamed in the issue). Despite such inconsistencies in his motivation, a disappointing resolution and his occasional "puny human" fixations, the Over-Mind had the potential to be one last great FF foe for Stan, created outside the shadow of Jack Kirby. Sadly, while the character continued, it was in the pages of titles like Captain Marvel, The Defenders and Quasar. His rare returns to The Fantastic Four title were an appearance in the 1990 annual, and a silent cameos in #568 and the 2005 mini-series Fantastic Four: Foes. Probably the weakest instalment of the year was #115, which featured no less than 12 pages of exposition from The Watcher. With this in mind, it’s perhaps understandable that the most plotless issue of them all – a Hulk-Thing clash, only their third, ten years in – is the best. There’s something so viscerally pleasing about seeing two of Marvel’s biggest hitters going at it, even if some form of plot intervention normally does get in the way of one of them killing the other, this time Alicia calling out to Ben just as the Hulk lands a haymaker. A rare moment of humour in 1971 creeps through with the Thing lifting up a General (Irving) Forbush statue (a fictional member of the Marvel Bullpen, invented by Stan for kicks), and this duke-it-out issue really does sit up there with the best of them. Sadly, such a plot was reattempted two years later, but with a cynical attempt at post-modernism. As the Thing hired out Shea Stadium for a showdown with a similarly-strengthed opponent, it only served to highlight just how shallow such a plot is, and undermined it. The year concluded with the first of a two-part Diablo story that contained arguably the weakest-ever cliffhanger to a FF story (seeing some war planes nearby, Johnny decides it's nothing to do with him and flies off) but did tie in to current events. Of course, it's a stretch to assume that the team behind 1971's output were looking to feature Mexico after the Corpus Christi massacre that June, but it's an oddly fortuitous moment to see the Central American city of "Terra Verde" under such strict military control. Featuring Crystal drug-induced into posing as the Mayan deity Ixchel, the Goddess had many holy places of worship, but the main inland place would have been Acalan, or what is known today as Campeche. And although Terra Verde is a fictional Mexican location, it became a real-life resort in 2003, based in Florida. The year does bring up the question of the process of "swiping", or taking from another artist's work, a subject which is particularly prudent for the 1970s. This site won't unduly come down on a "side", but instead merely present established facts, one of which is that Rich Buckler (who joined the title in 1974) and John Buscema were noted for having panels that were distinctly similar to Kirby panels of the 60s. When Rich Buckler was kind enough to give an interview with this site, he acknowledged that a lot of his earliest work resembled Kirby strongly, noting that it was "partly due to the level of my drawing ability at the time, and my preferences for dynamic storytelling and action in Super-Hero comics (which always favored Jack Kirby and John Buscema). I couldn't draw (yet) at John Buscema's level, but I thought--hey, I can sure give it a good shot to try to capture those Jack Kirby dynamics!" While Buckler always denied claims of swiping, it's perhaps somewhat ironic that the more well-regarded John Buscema was open in his use of previous work by Kirby, stating in an interview with Jack Kirby Collector #18: "Every time I needed a panel, I'd look up at one of his panels and just rearrange it. If you look at some of the early stuff I did - y'know, where Kirby had the explosions with a bunch of guys flying all over the place? I'd swipe them cold! (laughter) Stan was happy. The editors were happy, so I was happy." 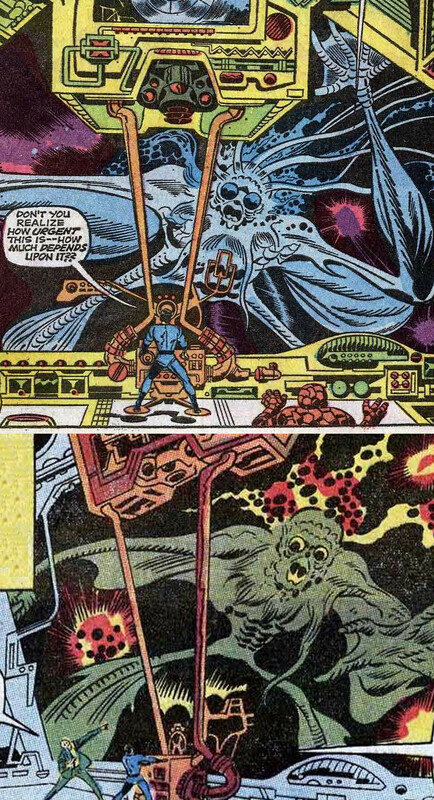 It seems that the editorial wanted the successful style of the Fantastic Four to continue, and while Buscema is very much his own, vibrant, artist, he was not above taking inspiration from the man who started the title, as with the two panels seen right... the top one Jack's, the bottom one John's. Whether it's acceptable to "homage" another's work while learning the ropes of a title is, of course, entirely open to question and personal taste. Perhaps one of the most cynical sales ploys of Marvel was a page increase in the November issues of their comics. The Fantastic Four's final battle with the Over-Mind ran to 34 pages, which justified a one-off price hike to 25c instead of the usual 15c... but when the comic returned in December, it was back to the usual page count, but now priced at 20c. It surely wasn't a coincidence that readers were seemingly treated to a price drop of 5c, when in reality it was a price increase. One of the most notable elements of the letters pages around this time was readers complaining about the use of word balloons on the covers, claiming it looked tacky. However, this was actually the reintroduction of a long tradition, something that took place on 80% of the first fifteen issues. While it had started to become phased out fairly early on, (appearing just once after #20), Jack had recently relapsed, with #98 and #101 giving in to temptation. John Romita Jr. and Buscema continued, though it must be said that it does look cheap and derivative when John does it. While John Buscema was a first-rate penciller and arguably better than Kirby, Jack was leagues ahead in cover art composition. With John Buscema many of his front covers have no sense of placement or symmetry, and look instead like they could have been straight lifts of mundane panels. No "If This Be Doomsday" grandiosity here, instead we get bland, decentralised images like #111, one of the worst covers of all. Aesthetically the most interesting of the run is #108, which is an innovative “flashback to a story that never actually happened in the comic” device. The reality behind it all is that it was unused Jack Kirby work that Stan decided to make use of, having John Romita and John Buscema blend it in to a cohesive whole. Despite its patchwork origins, it actually works very well, even if the concept of nega-power is ultimately too vague and the issue reinforces the myth of schizophrenia being a multiple personality disorder. While Janus is established quite nicely, his plotline seems to fizzle out without adequate resolution in in Issue #109. However, the actual issue itself is not without charm, and having Buscema/Romita do the "present day" panels, with Jack Kirby's art the "flashback" is superbly witty. In 2008 Stan got back with Joe Sinnott to recreate Jack's original vision (along with some missing panels created by Ron Frenz). While it can't be entirely accurate to what would have been published at the time (Sue has a digital camera, and Ben reads the Doonesbury newspaper strip that didn't begin until October 1970), it's a decent enough recreation. John Morrow of The Jack Kirby Collector has a page description of events, which is surprisingly critical of the 1971 version, considering this is an official Marvel product. Although The Jack Kirby Collector, a fine publication, would naturally come down more on Jack's side, the publication of the work saw lots of reviewers use it to critique Stan's involvement. Yet reading the "original", pre-edits, it's striking how little difference there is between the two versions. 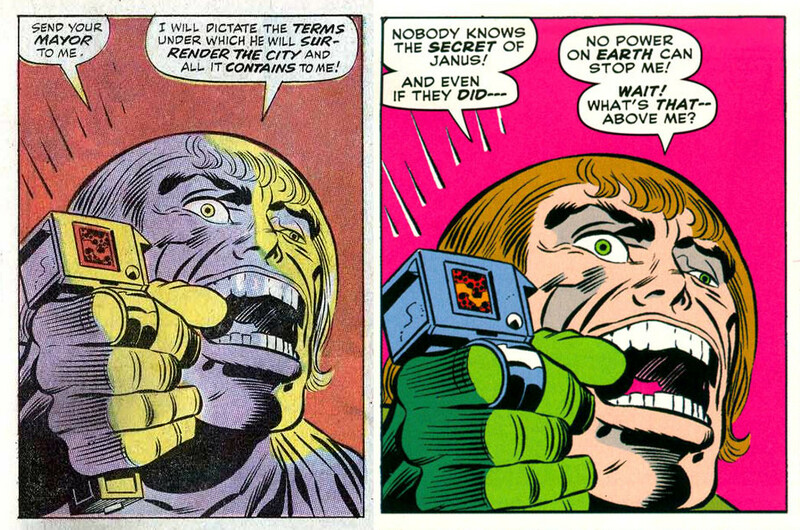 The "flashback" sequence in Issue #108 - which sees Ben and Johnny conveniently placing some bank deposits just at the same time as Janus tries to rob it - is also a flashback in Kirby's original, displayed on a projector to a scientist friend of Reed's. The ending takes place without the shooting of the evil Janus, which may please some who like a "purer" story, but even the biggest Kirby supporter would be hard pressed to rate "The Menace of the Mega-Men!" as little more than just an okay issue. It doesn't help that the 2008 colouring is unsympathetic to the material and far less nuanced than the version published in 1971, as can be seen with the example of the same panel at the top of this section. Ultimately, it comes down to personal taste, but it's the view of this site that when it came down to a story to scrap and repolish, then in this instance... Stan was right. While the run can be appreciated without it, it’s worth noting that there are four instances of other comics crossing over into its plot lines. The first, and most tenuous of all, was a crass plug from Jarvis, the Avengers’ butler, who claims in #116 that they had to leave the city on an urgent mission (Avengers #93), while the same issue marks the first appearance in the FF of The Stranger, a character who had debuted in Uncanny X-Men #11 (***) and was making his sixth appearance in a Marvel comic here after facing off against The Avengers, The Hulk and the Silver Surfer.